The Layner missile warhead, which will used by the Delfin class submarines, is in many ways superior to the Bulava. A Russian defence industry source told Interfax that the new Layner (Liner) ballistic missile was inducted into service with the Russian submarine fleet in the beginning of 2014. The Delfin class strategic submarines in the Northern Fleet will be armed with this new ballistic missile. This will allow the APL (Atomnykh Podvodnykh Lodok – nuclear submarines) to maintain a high state of combat readiness at least until 2025-2030. The R-29RMU2.1 Layner is around 15 metres in length, has a diameter of 1.9 metres and a launch weight of more than 40 tonnes. The missile system allows for salvo as well as individual missile launches when in motion at a depth of up to 55 metres and at speeds of up to 7 knots. The test programme for the Layner ballistic missile was completed in October 2011. Two test launches of this missile were carried out in total and were deemed a success. The new Layner missiles are expected to be used alongside the modernised Sinyeva ballistic missiles as part of the weapons system for the Delfin class submarines. The Layner missiles are actually a modification of the Sinyeva. The missile has the same flight performance characteristics as the Sinyeva, but with more modern missile defence suppression systems and a longer range. This missile incorporates the potential for a combined warhead. The Layner is capable of carrying between 9 - 12 low yield warheads, which makes it superior to that of the Bulava missile. In terms of its high payload to weight ratio it is superior to all solid fuel strategic missiles in service in Great Britain, China, Russia, the U.S.A. and France. Moreover the warheads can be installed in parallel with the missile defence suppression system. 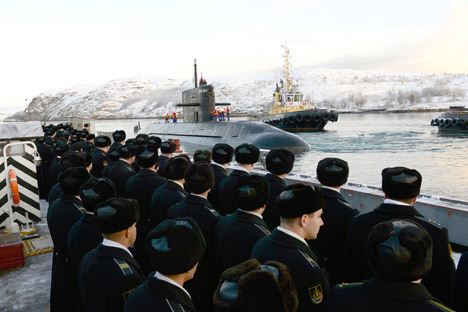 According to a fleet representative, the Layner are needed while the next generation project 955 Borey class submarines with Bulava missiles are completed and enter service. Russia’s strategic naval forces remain state of the art, two Borey class submarines have entered service, a third is undergoing state testing while a fourth is under construction. Although some military personnel like the former Chief of the Strategic Rocket Forces Headquarters Vladimir Yesin think that the Layner is in direct competition with the Bulava, this is not quite true. It would really be wrong to compare them, at the end of the day they are designed differently: the Sinyeva and its “successor” the Layner are liquid fuelled rockets, while the Bulava uses solid fuel. Apart from that these missiles belong to different weight categories: the Sinyeva is heavier (by at least 4 tonnes) and is larger (by about 3 metres). According to military sources there are no plans to develop the Layner missiles further, despite their advantages over the Bulava. Russia is already on course to create solid fuel ballistic missiles for the navy in the future. Even though asymmetric dimethylhydrazine (liquid fuel) missiles are more powerful than soild fuel missiles, they are more dangerous to use particularly for the navy. Based on articles published by RIA Novosti, Itar-Tass and Interfax.